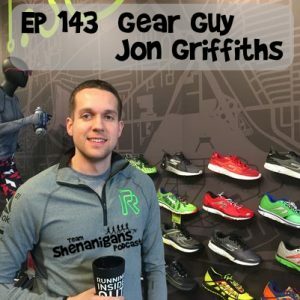 In this episode we talk about the latest in running shoes and other gear with Gear Guy Jon Griffiths, owner of Rochester Running Company from Chris’s neck of the woods. We talk about some under-the-radar running shoe brands, the latest trends in running shoes, advice on selecting trail shoes, and some new technology in hydration vests and fueling options. Plus – you know we HAD to talk about Goodrs. Jon is a former golf pro, and a fire fighter for the City of Rochester. He opened Rochester Running Company about two years ago and it has quickly become the destination of choice for Rochester-area runners to gather for group runs. With 100 or more runners participating in free volunteer-led paced group runs every Saturday morning, plus other group running and fitness activities Sunday-Thursday, he has built a welcoming community for runners of all ability levels. You can find out more about Rochester Running Company at http://www.rochesterrunning.com, follow them on Instagram @rocrunningco,Twitter @rocrunningco, or Facebook at https://www.facebook.com/RochesterRunningCompany/.